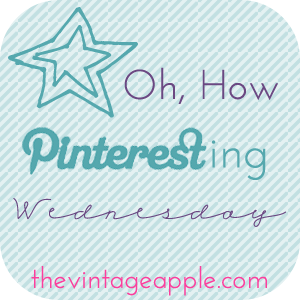 Ok, so I missed Oh How Pinteresting Wednesday. In my defense though, I worked an 11 HOUR SHIFT yesterday. So I was exhausted when I got home. But I love Oh How Pinteresting so much that I decided to do it on Thursday(today) instead. with Michelle from The Vintage Apple. Absolutely love love love the last picture post. SOOOO CUTE!!!! Lovely pins this week! I enjoyed looking at them all so thanks for sharing them. If you have time to visit my blog my Pinterest Party has just started! I have also started a Pinning Bloggers Master List that you might want to link up to! Crafty Chefy... Yet More Crafty then Chefy.